D&R S.J. Rimboche in a 1938 straight black grain relief Dunhill OX Shell bulldog with a silver band repair with a black vulcanite stem. Almost half way through this bowl of D&R VIP in a 2004 smooth long shank Canadian Trever Talbot Ligne Bretagne Faite en Bretagne 4/3 with a black vulcanite stem. Angler's Dream in a smooth medium bend 2011 Rinaldo Collection Fiammata Silver Line 7 Odea 4 flame grain bulldog with a silver band and a tortoise shell acrylic stem. Granger in a 1970s slight bend black sandblasted Comoy's Silver Cloud 624 sitter with a silver pearl gray acrylic stem. John Patton's Storm Front in my RDPipes Devil Anse. Custom made by our member of the BoB Ron Powell. I have accumulated many pipes over the past 48 years, this Devil Anse is one of my top 3 favorites. Not for its beauty and superb craftsmanship, but for the way it smokes.....OUTSTANDING! Good evening to you all from Greece, here is a photo from my morning visit in a local Cafe here in Athens. The rustic-paint work on the pipe is mine, i added the band and a new mouthpiece. 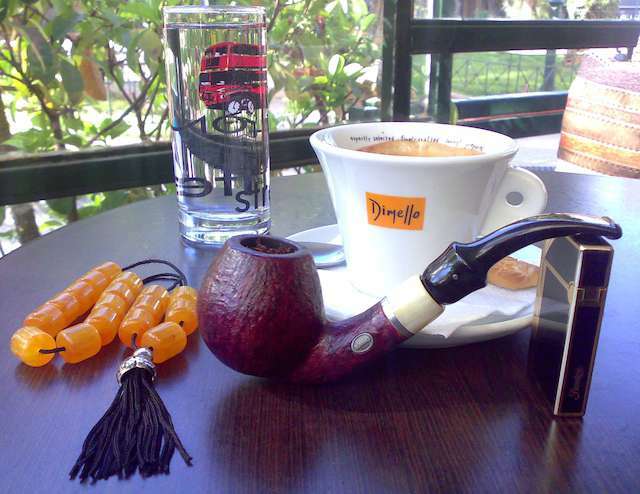 Penzance ( jarred in 2002 ) in my restored Wally Frank Oom Paul pipe. P&W #10 in a Becker & Musico bent bulldog. Granger from the mid 70's in my Radice Classic Smooth Liverpool pipe. Ardor Urano Fantasy Bent Apple with Silver Band, Marked DR, this pipe has only been smoked twice prior to me receiving it. Thank you to a dear friend of mine!! Just finishing smoking Edward G. Robinson's Pipe Blend in a 2014 Basil Meadows smooth slight bend squashed tomato with an aluminum band and a black pearl acrylic stem. A bottle of Sprite is my drink. The last of this sample of Park Lane Connoisseur’s Flake in a brown sandblasted medium bend 1970s Savinelli Autograph 5 freehand with a black acrylic stem. This pipe has a big bowl, so I'll be kept busy for a while with it as I watch the Braves-Pirates game. Rattray's Marlin Flake dated 2009 in my Don Carlos Smooth Bent Bulldog pipe. This is a stunning piece of briar on this hand made pipe!! PS, just shaved my long beard off. Look 10 years younger! A quarter of the way through this bowl of 2012 Rolando’s Own in a smooth straight Lane era Charatan Executive Extra Large stretch apple with diagonal channel cuts on the lower right and left of the bowl along with a black vulcanite double comfort stem. This pipe was formerly owned by actor William Conrad. A bottle of Mountain Dew made with pure cane sugar is my drink. Villiger Jamaican Export in a 2002 IMP smooth full bend egg shaped meer with a black acrylic stem. John Patton Store Front in my Stanwell Royal Guard with a bent wide comfortable stem. This is a CHUBBY flawless piece of briar!! Now smoking D&R Three Sails in a three quarter bend smooth 1985 Dunhill Chestnut 5202 with a cumberland stem. Ice water and bergs is my evening drink. Pipe of choice: Radice Chubby Reubens Rhodesian Shape Bullcap Bulldog, opened the draft hole to 5/32". This pipe is now in my weekly rotation, smokes much better!! D&R A,P. 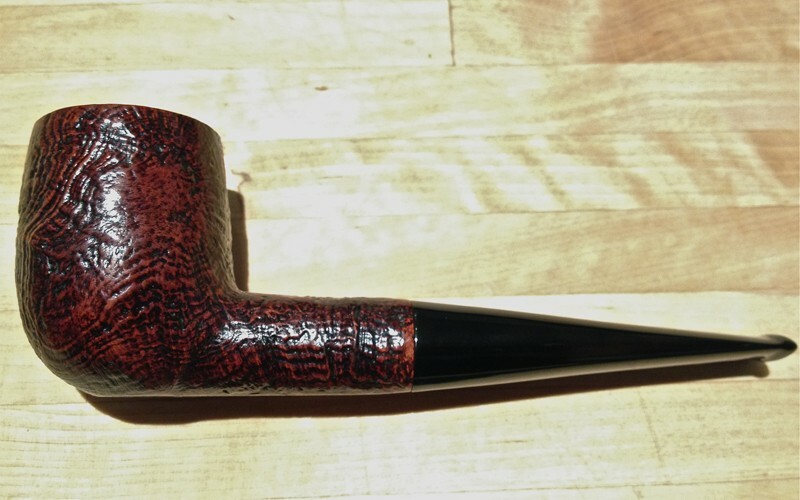 Rimboche in a 2002 black short shank grain relief straight Caminetto 6.L.17 tomato with a black acrylic stem.